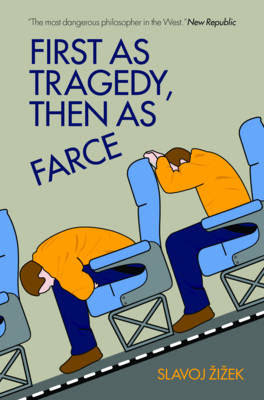 First as Tragedy, Then as Farce. Slavoj Zizek. New York: Verso, 2009. 157pp. Two relatively recent events have arguably been among the most influential in the contemporary global politico-economic climate. The terrorist attacks on September 11th helped to usher in a climate of fear in the West and renewed war in the Middle East. Slavoj Zizek, a Marxist philosopher and cultural critic, writes: “September 11 heralded an era in which new walls were seen emerging everywhere: between Israel and the West Bank, around the European Union, along the US-Mexico border, but also within nation-states themselves” (2009:3). Eight years later, the global economic crisis of 2008 precluded a further cementing of those divisions between the wealthy and the poor – the haves and the have-nots. Zizek uses these two events that help to define the beginning of the 21st century as a jumping-off point from which he details the roots and reasons for what he calls the coming catastrophe to be brought on by today’s global capitalism. Further, he attempts this analysis from a point of view outside of the capitalist system: “How does our predicament today look from the perspective of the communist idea?” (2009:6). In this approach, he lays the groundwork for his argument that communism remains not only a viable option, but perhaps the only option for humanity to avoid the catastrophes being brought on by global capitalism. Zizek’s dialectic approach engages numerous scholars who have commented on the current state of global humanity, capitalism, and socialism. Through this dialectic, a larger reality – one beyond the immediacy of our everyday lives – is revealed, and it becomes clear that Capitalism appears to be near its end-point. Zizek begins with a commentary on the rapid expansion of the gap between the rich and the poor. He describes the rise of a global super-rich, who are increasingly insulating themselves from the masses of the lower class. In describing a Chinese suburb that replicates an English town and was designed for the wealthy, he notes: “There is no longer a hierarchy of social groups within the same nation – residents in this town live in a universe for which, within its ideological imaginary, the ‘lower class’ surrounding world simply does not exist” (2009:5). The Poor’s role in the world of the wealthy, then, becomes their very non-existence – they only exist in their non-existence. Labels: anthropology, book review, U.S.
Great review! I like your contextualization as well as your critique of Zizek's argument. The title of the book reminds me of something I learned a long time ago -- something about the moment when tragedies enter public discourse in ways other than solemn discussion or analysis (i.e. spoof/farcical/satire/etc.). I wonder if this ties into anything Zizek says in this book.